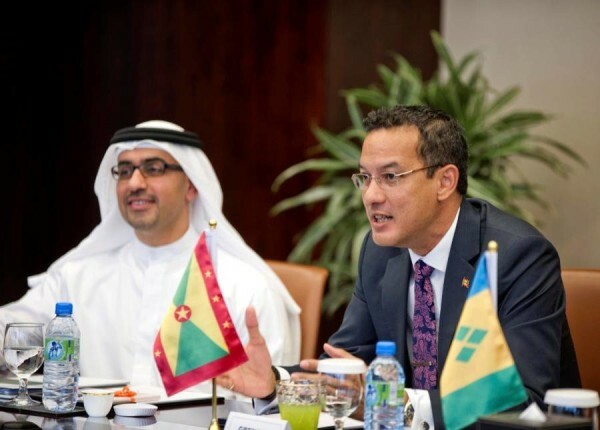 Minister of Foreign Affairs and International Business, Honourable Nickolas Steele, has spearheaded the proposal to establish a CARICOM diplomatic presence in the United Arab Emirates (UAE). CARICOM countries have been invited and urged to move with alacrity and purpose to establish a diplomatic mission in the United Arab Emirates, with the seat in Dubai, and Minister Steele has engaged other ministers of CARICOM for closer engagement with the UAE, moving forward as a bloc, in the region’s best interests. This invitation was extended to representative Caribbean Ministers of Foreign Affairs by Minister of State in the UAE, Her Excellency Reem Ebrahim Al Hashemy, and assertively endorsed by Vice President and Prime Minister of the UAE, and Ruler of Dubai, His Highness Sheikh Mohammed bin Rashid Al Maktoum, in meeting with the Caribbean Foreign Ministers in Dubai on Wednesday 7 May. Minister Steele and his colleagues cautioned that even under one CARICOM Mission umbrella, individual Caribbean countries must work to ensure that their diplomatic integrity and interests are represented and preserved. Within the framework of formalised diplomatic relations with the UAE, major cooperation agreements have been reached, including the provision of strategic assistance in much of the Caribbean’s key developmental agenda areas: health, education, housing and infrastructure. Others are expected to follow. Both regions will also move forward speedily with enacting cultural exchange programmes that will enable CARICOM countries to promote their attractiveness in and to a non-traditional business market, well in advance of EXPO 2020, which will be hosted by the UAE. The EXPO 2020 is expected to attract over a period of six months, 25 million visitors to the UAE, and create approximately 277, 000 jobs that will spread beyond the natural borders of the UAE. The Caribbean region is hoping to benefit from some of these opportunities. The enactment of the formalised relationship was the result of Minister Steele’s vision. Other representative CARICOM Ministers of Foreign Affairs – Ministers Mitchell (Bahamas), McLean (Barbados), Gonsalves (St Vincent) and Nesbit (St Kitts), as well as other ministers’ representatives from Trinidad and Guyana – all endorsed the agreement, and joined him at the negotiating table with the UAE officials. Grenada and the UAE have enjoyed diplomatic relations for some time now. The recent initiatives undertaken by their respective foreign ministers are geared toward strengthening that connection. Grenada and the Bahamas have already laid the groundwork to open individual missions in Dubai, with a view to extending their countries’ interests and visibility in what has been hailed as the most innovative and fast-growing region of the world, the United Arab Emirates.